Sarah, Cynthia, Kim and Kristin were in the city that started the love affair with the girls – Newwwww Yooooork – for the premiere of SATC 2. They opted for simple sophistication vs. over-the-top glam-a-drama that the show is known for. Then again, this is only the first premiere of thousands! Four tall drinks of water! Her hair should Always look like that and the dress was dreamy on her. And while this would be boring on Renee, I like the feminine touch on Cynthia. It's a change of pace from her usual simple lines. Where would any of them be without this woman? 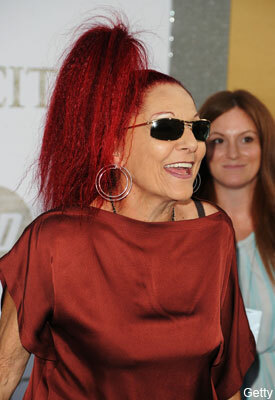 The fabulous Patricia Field. Jessica Szohr of Gossip Girl rocking skinnies and sheer chic. Images courtesy of Grazia Daily, sources as noted.